There is this person I have been meaning to ask out on a date, but I always end up just saying “See you later!” instead. In trying to simplify Signal Detection Theory and imagine how Signal Detection Theory rears its head in my personal life, I keep coming back to this interaction that ends up in me not pursuing this person. Signal Detection Theory is much more straightforward than its haughty title would suggest. It stems from the fact that nearly all reasoning and decision making occurs in the presence of some uncertainty. Signal Detection Theory holds that the detection of stimulus depends on both the intensity of the stimulus and the physical and psychological state of the observer. Its data is presented in a 2x2 matrix with four possible outcomes. The four outcomes are Hit, False Alarm, Miss, and Correct Rejection. Hit means that the signal is present and the observer is able to correctly detect its presence. False Alarm means that the signal is not present, but the observer incorrectly detects that it is present. Miss means that the signal is present, but the observer is unable to detect its presence. Correct Rejection means the signal is not present and the observer correctly does not detect its presence. Going back to my earlier example, whenever I speak to this person - let’s call him Will - we always have really witty banter together. There is something about our conversations that feels like a signal is present telling me to “YES! ASK HIM OUT!” but the signal never feels intense enough for me to actually ask him out. As I did/do not ask him out, I was/am either missing an opportunity to go on a wonderful first date or correctly rejecting a very awkward conversation. Frankly, the latter option is deterring enough as it is that I don’t mind missing an opportunity to go on a date with Will. 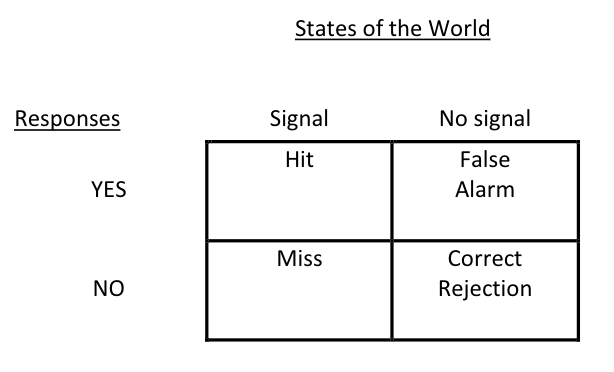 Signal Detection Theory has to do with the process of gauging how strong a signal is and gauging the risks associated with acting on the presence of the signal in order to make a decision about something. In regard to design, Signal Detection Theory is a handy means of assessing a system’s functionality. It reminds us to reduce noise and increase the intensity of our signals in order to reduce the chances of misses and false alarms, especially in high risk situations.